Ring in spring with this issue full of ideas for refreshing your home inside and out. Tour gorgeous homes blooming with style and learn from homeowners who’ve remodeled and renovated their way to their dream homes. From budget friendly ideas to smart ways to invest, we’ve got everything you need to makeover your spaces. Bonus in this issue? The Furniture Guide! 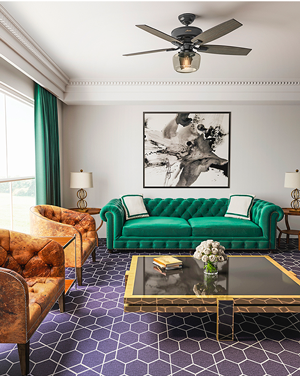 Our list of new classics for timeless style in every room. Make every room in your home cool and breezy with Hunter this summer! Right Now, for a limited time, enter your info below to win three beautiful ceiling fans. (You pick the styles.) But hurry: Contest ends June 21! 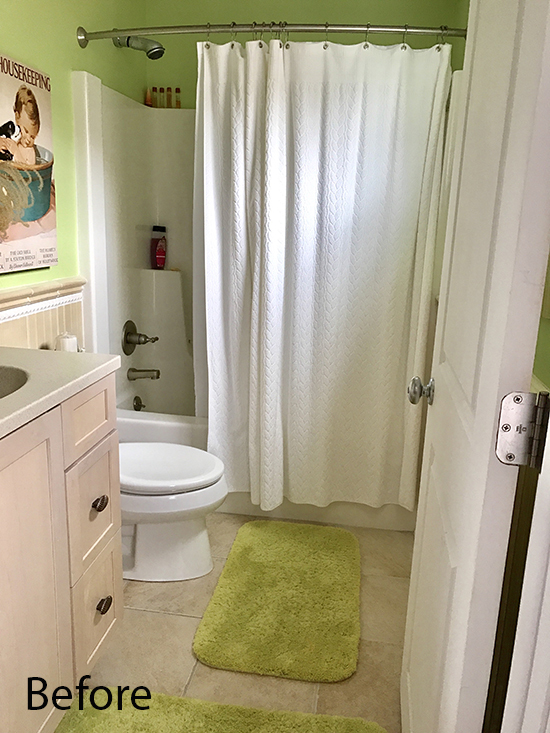 Victory Farms: Bathroom Remodel & Reveal! See how our picks for tile, lighting and the curb-less shower come together. And here at long last is the redesigned space! 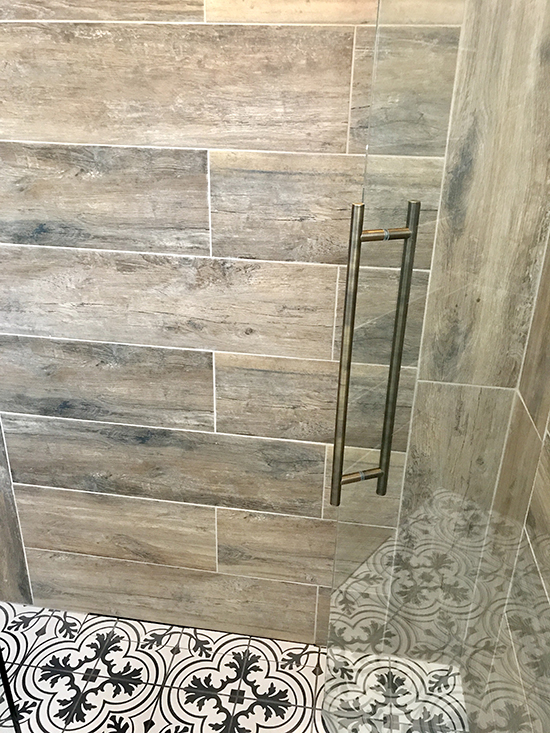 Knowing that the shower was going to be a nice size, I wanted to use a larger tile to make the bathroom feel substantial. I started by sharing 12” x 24” tiles for the shower walls with V that looked like actual barn wood. This was an easy decision made, she loved it! Since the shower floor was curbed less it would share the same tile that is on the floor. I really wanted this to be a statement and pop the rest of the room. I sent some ideas to V for a black and white vintage feel. 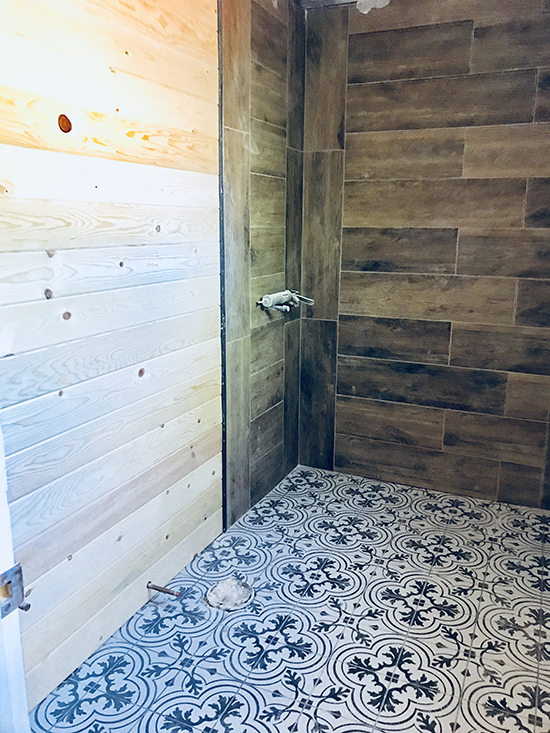 This room was going to have a lot of foot traffic, so I leaned more towards porcelain vs concrete tile since concrete tile does not maintain well in the shower. 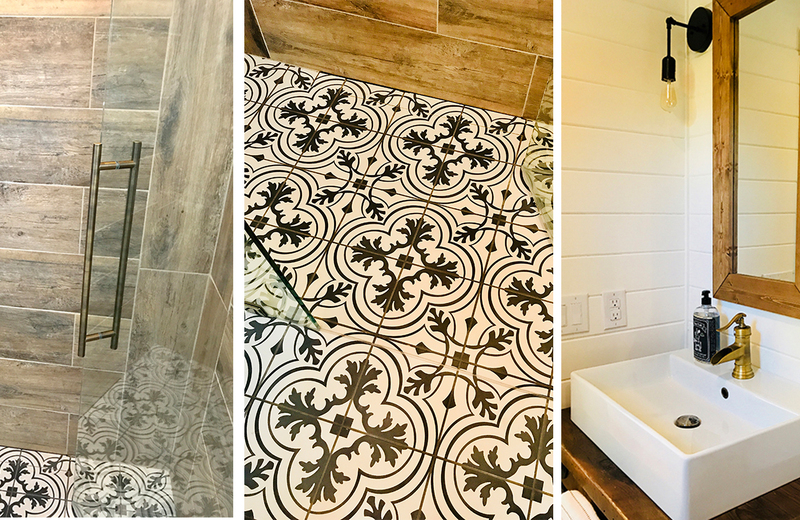 After going through some options, the decision was to go with an 8” x 8” black and white tile that really complimented the barn-wood tiles. As for the finishes, since I really don’t like being traditional, I showed V some antique brass finishes and they were a definite winner. I felt these finishes would really warm up the space and keep the vintage charm. I wanted to keep the vanity a real unique piece while picking up that natural wood look. Being said, I sketched up a design and sent over ideas to my friend Jen at Blue Moon Vintage Market a local reclaimed market and she was able to custom make me exactly what I wanted! I started searching for a white vessel sink to accommodate the size of the custom vanity. I also reached out to a really creative Etsy store who made custom barnwood mirrors that was able to make the size I needed to go above the vanity. Picking out the lighting was also super fun! 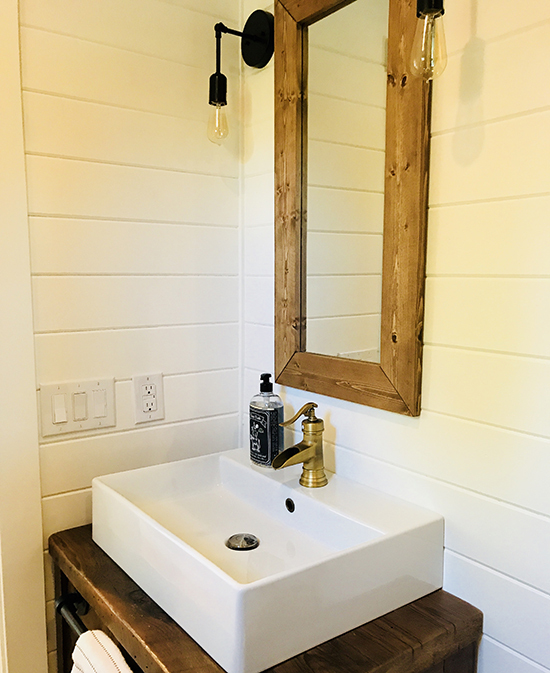 After reviewing several options, V chose to go with the black industrial teardrop lighting for each side of the reclaimed wood mirror which was my favorite pick. My favorite part of the bathroom remodel for last: the shower glass. I wanted to make sure when walking into the bathroom it would feel like the glass didn’t exist. So, I met with my local glass company to show him what I was wanting to achieve. I ended up deciding on a 36-inch glass door with a 36-inch glass panel that would run to the ceiling. This gave us great height that would incorporate that invisible appearance. 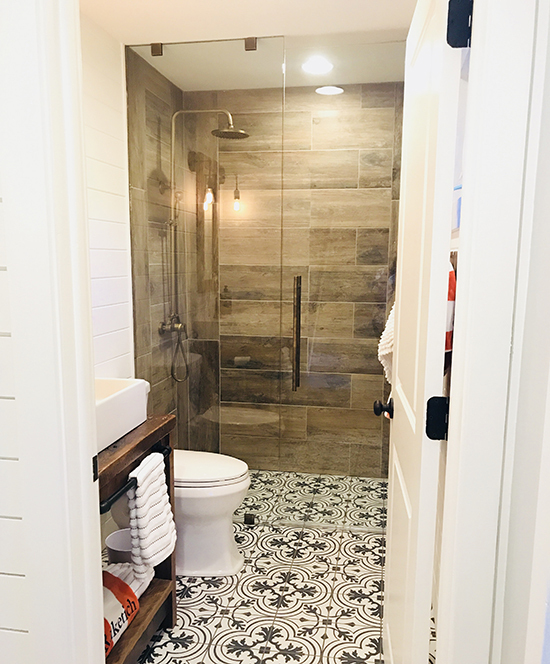 I chose antique brass clips and hardware for the glass that would blend with the overall finishes and wood tile so they would disappear vs standing out. V really loved my idea for the black industrial pipe for the stairwell, so I had my team make her toilet and towel accessories out of the same material which would really show off the black industrial lighting and tie in the space. For more on Betsy Glass, The Flippin Designer, check out her portfolio, here. 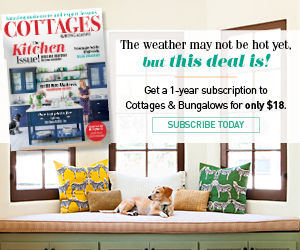 Sign up to receive the best of cottage style directly in your inbox! 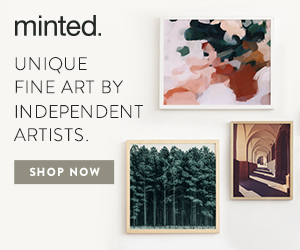 To get cottage renovating and decorating ideas delivered directly to your inbox!